Hazel Atlas Fiesta was produced in the mid-1950s. The significance of Fiesta is that it was produced on a more opaque Platonite. This would indicate that Hazel Atlas may have changed their Platonite formula for the white opaque glass. Fiesta was produced on the Moderntone blanks. The pattern name Fiesta was also the name Homer Laughlin assigned to their color scheme of dinnerwares around the same time. The Hazel Atlas Fiesta may have been an attempt to compete or compliment the Homer Laughlin dinnerware, since the deep colors are quite similar. Above is the color scheme for the salt, pepper, cream and sugar. In this picture you can see the brilliant white of the Platonite glass. Assembling a complete set may take some time, be prepared to look hard and possibly pay a little extra. Especially for the rare color cream and sugar. One other rare piece in the Fiesta is a tall chocolate mug. The red chocolate mug recently sold for $40! 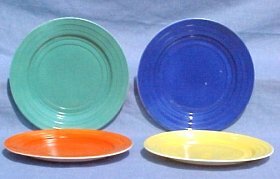 Above are the four colors of dinner plates included in a set. Each set came with the color scheme of dark blue, bright orange-red, yellow and a pale green. Serving pieces included vegetable bowls, salt and pepper, cream and sugar and two types of platters.